We'd venture to say that three out of five mother-daughter duos have some of sort bonding moment involving Coach bags (fully made-up stat, but it feels true, doesn't it?). That said, we'd venture to say there's only one mother-daughter pair who's had a Coach experience involving a multimillion-dollar fine. The luxury handbag brand just won a lawsuit against Linda and Courtney Allen of Syosset, New York, for operating two web sites (Bellafashions.net and MyClassyFashion.com) that sold and advertised fake Coach handbags. Awarding Coach $44 million dollars, the Manhattan federal court also granted a permanent injunction against the sites, which sold fake Coach bags in plain site as "not original" designs, and "in no way affiliated with the authentic manufacturers." 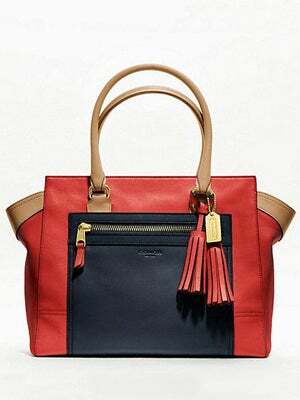 (Real) Coach Legacy Colorblock Carryall, $458, available at Coach.